Britta is a sojourner. She grew up a military kid and is now a military wife, currently living in the high desert of Arizona — which feels so very far from her New Orleans family. 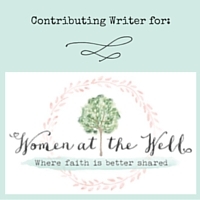 Britta loves to write about the intersection of God’s Word and her world. Wife, mom and Jesus girl best describes Carmen. She has been married to her fella, Lary, for 38 years and has one beautiful daughter. She walks out her calling to women’s ministry as a Christian Women’s Hope Coach, writer, and speaker, lending her ear and heart to those looking to find hope in the craziness of life. Carmen is convinced her home in heaven will be beach-side with a chocolate filled closet, but until that glorious day, her family makes the Bayou State their home. I’ve been a “doer of things” for as long as I can remember! All those nit-picky little details that most people hate? Yea. I love them.And I love to turn vague, scary, confusing ideas and turn them into specific plans to accomplish a goal, one step at a time. Providing coaching, consulting and project management services to Christian bloggers, ministry and business leaders, I'm passionate about helping people more effective focus on their purpose in life and ministry. was born and raised in Texas, with a short summer in Oklahoma.I went to church as a child, and was saved when I was in the tenth grade.It was when I met my husband in high school, and later married that God began to change my life by watching this awesome man of Godly character – servant, loving, ready to give and give and give.I didn’t understand all that. I was one of those working moms, and now that I am retired and substitute teach, I have lots of time to spend in the Word and Bible studies. I can’t get enough. Dr. Michelle Bengtson is a board certified clinical neuropsychologist with more than 20 years of experience in the diagnosis and treatment of medical and mental disorders in children, adults, and seniors. She has been in private practice for more than a decade of that time. Speaker, author and doctor, Michelle is also a woman—a wife, mother and friend. She has experienced her share of trouble and trials and knows the pain of losing someone she loves as well as the despair that can follow trauma or illness. Liz is a veteran turned Army wife and mother to two boisterous boys. After leaving the military to become a full-time mommy, she decided to turn her passion for creativity into a business. She is passionate about encouraging women to leave behind their MESSES and embrace the MEMORIES as they become the MASTERPIECES God created them to be. Ellen pens her stories from the Bayou Country of South Louisiana, but her heart and birthplace are in Mississippi.She’s a Southern Belle through and through. When not writing, you can find Ellen digging in the flower beds, relaxing on her back porch, or traveling with hubby John. Ellen has loved writing since high school, but this passion lay dormant for many decades. When her mom passed away in 2011,Ellen felt the Lord urging her to write her stories, stories that help her see His faithfulness in her ordinary, every day life. She is passionate about scripture and shares the truth of God’s word at Ellen Chauvin (dot) com. It is there that she encourages ordinary women to walk in extraordinary faith. Kathy Shaull is an author and believer in the expansive grace of God. Her novels are set in her own corner of rural Oklahoma and focus on the theme that Everyone Deserves a Second Chance. She has a heart for those who have experienced loss and are in need of a positive thought, the simple Truth, or a smile. Merri works behind the scenes and behind the WordPress dashboard getting projects started and keeping them moving forward. She loves supporting bloggers by providing technical expertise so that they can easily communicate their message. Mitzi Neely encourages women of all ages through her experiences and shortcomings. She has been blessed witha passion and love for people that stretches across the generations. Her heart is to lighten your load, while conveying her message that nobody’s perfect. So often God places certain people in your life at just the right moment; whether the reason is to help teach you, help you grow in your walk with Him, or to simply love and lift up others. Whatever your struggle or need, you will find encouragement through her words. Helping folks find calm in the chaos of life inspires me. Best Selling Author. Speaker. Chaplain. Mom. A woman in AWE of God.